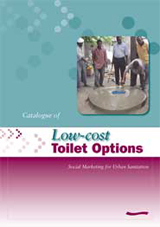 Low-cost toilet options - a catalogue: Social marketing for urban sanitation. This catalogue has been prepared to help houseowners in low-income urban communities choose an appropriate low-cost toilet option. It is designed to be used by toilet builders or other NGO or government fieldworkers who can support houseowners in their decision. Specifically developed for use in Dar es Salaam, Tanzania, it can also be used in many other low-income communities. The toilet options presented in the catalogue were developed on the basis of results from consumer research and tested in low-income urban communities. Toilet builders were trained in the construction of each design. This catalogue is one of the outputs of the Social Marketing for Urban Sanitation research project funded by DFID. The research was conducted by WEDC, Loughborough University in partnership with the London School of Hygiene and Tropical Medicine; WaterAid, Dar es Salaam Urban Programme, Tanzania; and Trend Group, Kumasi, Ghana. Please note this publication is available in hard copy only.